The idea for the wedding party has changed drastically since I started working on this month, and I'm very happy with the results! 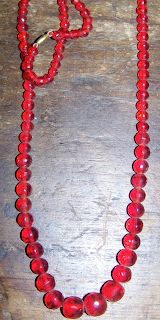 This red necklace was the first one I found that i actually liked. I want one that's long enough that the girls can wrap it around twice and still have length. The dress is simple and cute enough that you could accessorize anything with it an still look amazing!